Tuesday November 17th 1903 I left Burlington at 9:30 and reached West Liberty at noon. Ida & Mary were at the depot. Spent a very pleasant afternoon, got home at five oclock. Levi met me at the depot. Will came for me at supper time. We came home early. I unpacked my things and visited all the evening. Very cold. 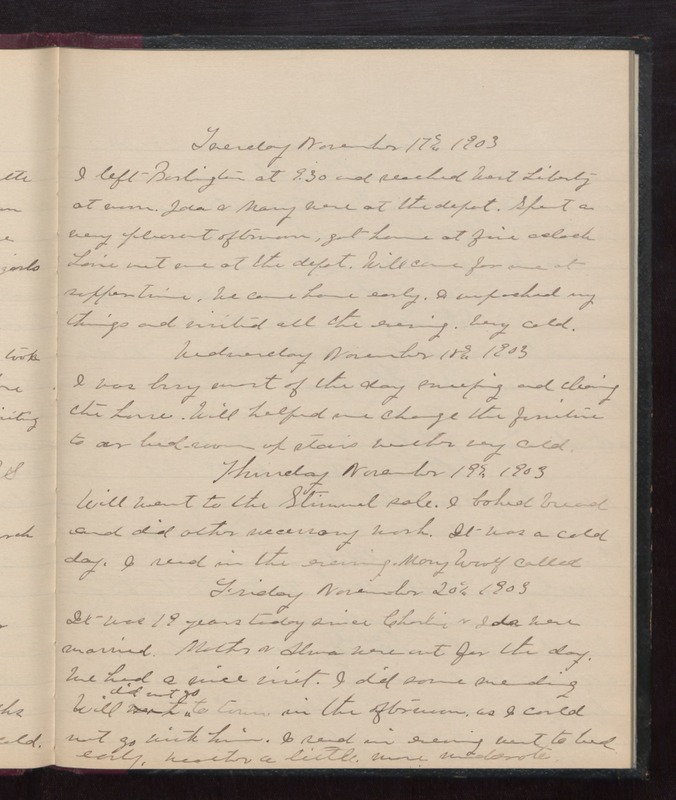 Wednesday November 18th 1903 I was busy most of the day sweeping and cleaning the house. Will helped me change the furniture to our bedroom up stairs. weather very cold. Thursday November 19th 1903 Will went to the Stimmel sale. I baked bread and did other necessary work. It was a cold day. I read in the evening. Mary Woolf called. Friday November 30th 1903 It was 19 years today since Charlie & Ida were married. Mother & Alma were out for the day. We had a nice visit. I did some mending. Will did not go to town in the afternoon, as I could not go with him. I read in evening went to bed early. weather a little more moderate.